The kids love this as much as the parents do. Amazing digital artwork! This is not a bounce house, it's a huge playzone! 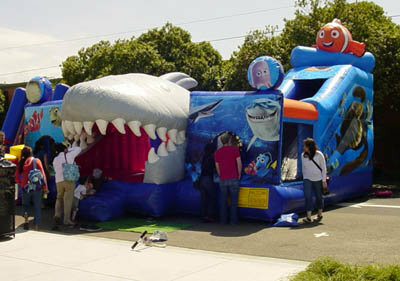 Finding nemo inflatable bounce house playground experience for party rentals games for school carnivals , festivals, corporate events and company picnic games. 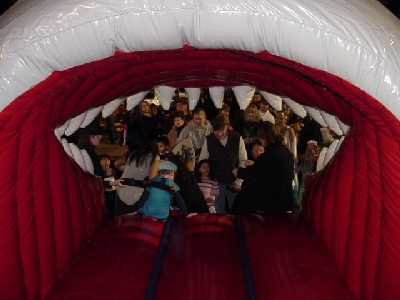 The licensed Finding Nemo Bounce House Experience aquatic journey holds 10 - 12 kids and begins by entering through the jaws of a great white! This jumpy house and sliding inflatable palyground bouncer offers several activities to choose from, a climb and slide allows kids to pretend they're riding the EAC with Crush, Squirt. Hurdles, barrels and pop ups take participants on their own ocean story with Marlin and Dory. The three-dimensional shark opening and killer digital artwork will get the party guests attention and draw a huge crowd to your event! Along with a killer 3D version of Nemo on top of the unit letting everyone know it's the 600 square feet of adventure across the the amazing artwork in a larger than life finding nemo inflatable jumper experience!